This Autumn Landscape is no longer available. Signed and dated (at lower right): J. W. Hill 1866 John William Hill occupied the middle place in a three-generation span of artists, all named John Hill. His father, John Hill (1770-1850), was a London aquatint engraver who emigrated to America in 1816, and sent for his family three years later. John William's son, John Henry Hill (1839-1922), followed a career as a landscape painter and printmaker. The Hill family arrived in Philadelphia in 1819, and in 1822 settled in New York. 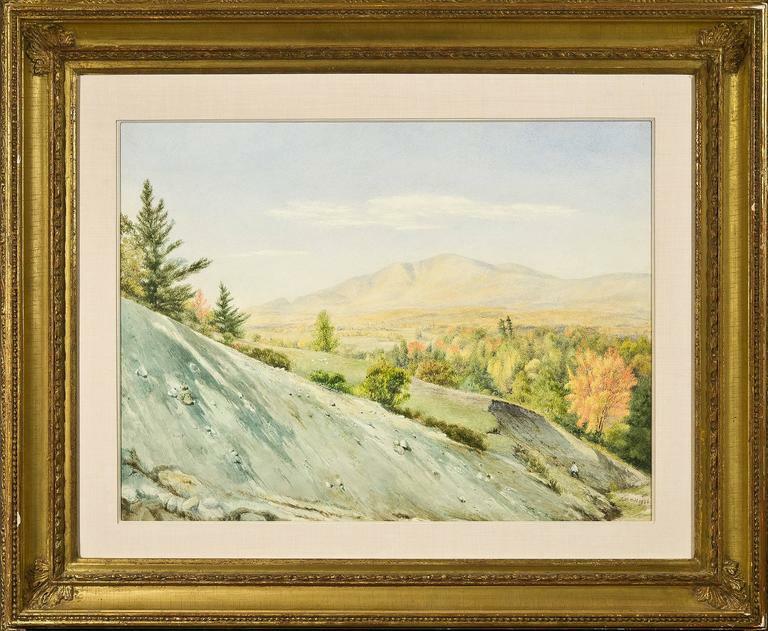 John William Hill served a traditional seven-year apprenticeship with his father, during which time both father and son worked on William Guy Wall's “Hudson River Portfolio” (1820-25). Hill first exhibited at the National Academy of Design in 1828, when that organization was only two years old. By 1833 he was an associate member, and exhibited his work there for the duration of his long career. In 1833, he returned briefly to London to study and to see Old Master paintings. Later, in New York, he served, from 1836 to 1841, as a topographical artist for the New York State Geographical Survey. 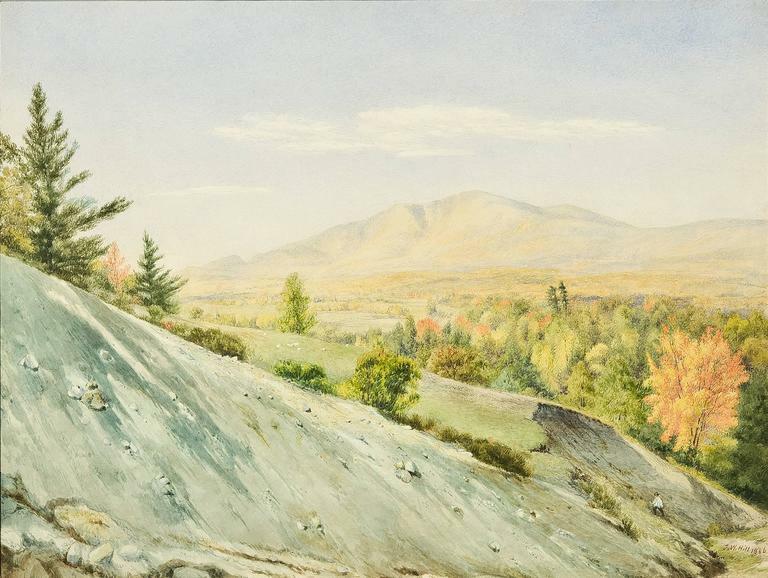 In 1836, Hill settled in West Nyack, New York, where he lived for the remainder of his life, maintaining an abiding interest in scenic views of his Hudson Valley environs. 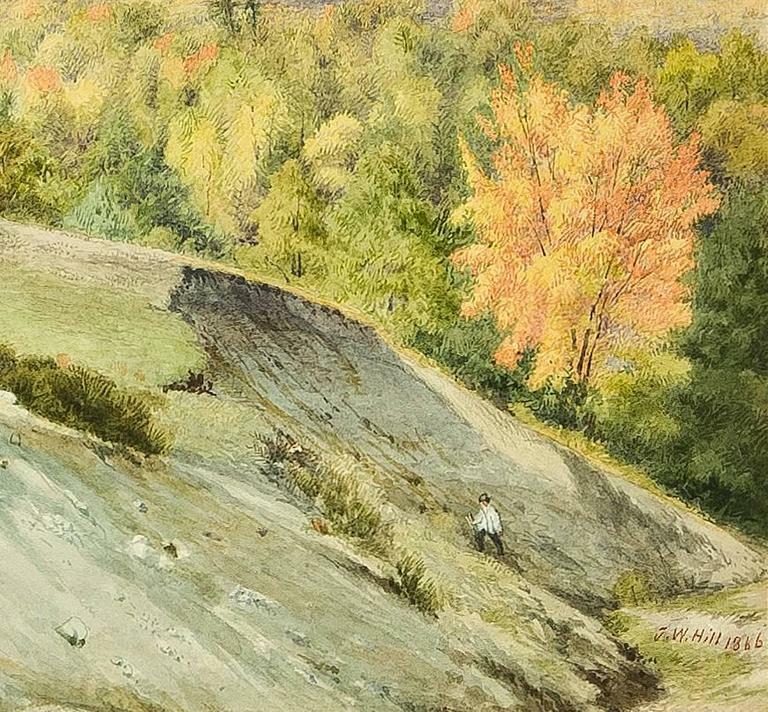 In 1850, Hill was among the founders of the New York Water Color Society, a short-lived organization which showed only once, at New York City's Crystal Palace Exhibition of 1853. About 1855, while the artist was traveling through New England and upstate New York pursuing his employment as a topographical artist for the print makers Smith Brothers of New York City, he read John Ruskin's “Modern Painters” and experienced a conversion to Ruskinian principles. Thereafter, he adapted his previous skills and interests to a Pre-Raphaelite style, painting landscapes as well as precisely observed still lifes directly from nature. By 1860, he was a friend of Thomas Charles Farrer, an English-born figure painter who was a central figure of the Pre-Raphaelite movement in America. In 1863, Hill served as president of the American Pre-Raphaelite organization, The Association for the Advancement of Truth in Art, although he was a generation older than most of its active adherents.